“We Honor Veterans” is a special program designed to honor those nearing the end of life who served in the United States Armed Forces. 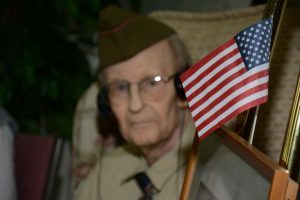 It is a national program originally founded by the Veteran’s Administration in conjunction with the National Hospice and Palliative Care Organization. The program is now incorporated by many healthcare organizations across the country as another valuable service to their patients. Brought to Four Seasons in 2015, this entirely philanthropically supported program is a partnership with local chapters of the Military Officer’s Association of America, honoring veterans under hospice care with special pinning ceremonies in which a certificate and pin(s) are awarded to the patient for their service. Four Seasons has been honored to serve over 400 veterans with this special recognition since the inception of the We Honor Veterans program. Patients are saluted by a current military officer during a ceremony in which family and friends are present to also honor the individual who served. Often, significant stories are shared, music requested by the patient or family is played, and a prayer may be offered. The ceremonies are customized to the desires of the individual being honored. In every ceremony, there is a spirit of reverence and gratitude for the service that the individual gave to our country. Four Seasons has been honored to serve over 400 veterans with this special recognition since the inception of the program. Approximately one third of the patients served at the Elizabeth House, the inpatient hospice facility in Flat Rock, are veterans. These patients have been given this special honor in their final days thanks to incredibly generous donations from the community. At any given time, over 25 percent of the patients being served by Four Seasons are veterans. As the We Honor Veterans program continues to grow, thanks to generous community support, the Four Seasons Foundation looks forward to future plans to build a Veteran’s Memorial Garden at Elizabeth House, and begin to offer veterans’ oral and pictorial stories. We would like to specially recognize and thank the Military Officers Association of America, for their dedication to and support of the Four Seasons We Honor Veterans program. With the help of a wonderful partnership with our western NC branch of the Military Officers’ Association of America (MOAA), Four Seasons is now a Level II Partner in the We Honor Veterans program. One of the incredible things we are able to do as a result of these partnerships is to honor our veteran patients with a pinning ceremony. The ceremonies are a brief, simple gathering of the patient with his/her family/friends and members of the patient’s clinical team with a member of MOAA to thank that veteran for his/her service. A certificate and pin(s) are awarded and the patient is saluted by the Officer present. Sometimes significant stories are shared, there may be music requested by the patient or family, and likewise sometimes a prayer. But at all of them, there is a spirit of reverence and gratitude for the service that this individual gave to our country. In the almost three years since we began offering pinning ceremonies to our patients, we have been privileged to pin over 400 patients. I cannot imagine that 2019 will see that rate slow down at all. We offer education around veteran’s concerns and are working to increase both staff and volunteer awareness of things that may arise for a veteran during their end of life journey. We have big hopes for additional community partnerships, a Veteran’s Memorial Garden at Elizabeth House and beginning to offer to record veteran’s oral and/or pictorial stories in the coming year. All we need in order to do these things is funding!!! If you know of a veteran who should be honored through the We Honor Veterans program, please contact us at 828-692-6178. If you are interested in supporting the program financially, please visit our Four Seasons Foundation website.